A A Milne’s ‘Make Believe’ was first produced at The Lyric Theatre in Hammersmith on the 24th December, 1918. The script suggests that the production at Markhouse, some 80 plus years later, was the revised version of 1925. First prize once more to the presenters for constructing on the wee stage, with much ingenuity, the outdoor scenes of a woodland dell, a tropical treasure island, the indoor settings of a school room and the Hubbard’s home, as well as the effective snowy street outside. And all within a short space of time. The piece is classed as an operetta, so members of the cast were called upon to sing and dance. No one actually outshone Maria Callas, but the dances were splendidly arranged by Miss Townsend, and there were some finely designed costumes made under the supervision of Mrs Kett. The story depicts a family of children, their visions, fantasies and their dreams which were realised in the scenes that followed a prologue (full of noise and bustle) that served to introduce them. Thus we had the story of the Princess and a rather embarrassed Woodcutter, Oliver’s Treasure Island that let us meet a host of pirates led by their chief, Chris Smith, and entertained by a chorus of dancing dusky maidens. It would be invidious to single out any of the youthful acting contributions because this was apparently so much of a team affair that I would hesitate to mention any without naming all. But as I cannot list all, I think that I should say that the performance by Jill Cooper as Rosemary was something more than what one usually gets from a young girl at school, and should lead on to bigger and better stages. 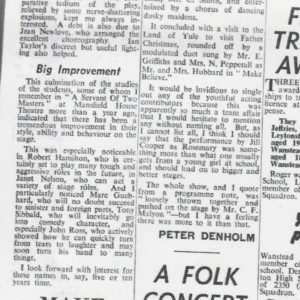 The whole show, and I quote from the programme notes, was ‘loosely thrown together and pushed on stage by Mr C.F.Malyon’ – but I have a feeling that there was more to it than that”.